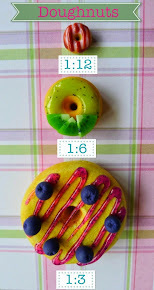 Littlest Sweet Shop: More 1:12 scale doughnuts! I have to admit, it's been a slow week in my Littlest kitchen. The Puppen Haus didn't survive the long trip from across the Atlantic so I have been spending a lot of time mending and repairing parts. I'm also waiting for a more detailed plan-book for it so it will be a few weeks until I receive that. Until then, I don't really want to assemble it yet. It's a very big, very expensive project so it's actually better that I take my time with it. I have also been making another new dress for Sadie. I'm quite terrible at sewing so it takes me longer to hand-make a dress for a doll. Not to mention, the instructions are all in Japanese and I don't understand Japanese (I know a few words from watching a lot of anime and reading mangas growing up, but nothing helpful in technical sewing instructions). So anyway, I thought I would show you more photos of another commission I did in 1/12 scale. Strawberry jam doughnuts covered in sugar. It's SO tiny! Unfortunately I'm still just using a semi-automatic camera that doesn't help me capture the finer details on this 1/12 scale model. The strawberry jam even has tiny bits of seeds in it! I added more 'jam' after taking these photos since I felt that the doughnut must look like it's been over-filled with too much 'jam'. Worked a treat since my client loved it! I also found more photos from my other commission with the 1:12 scale glazed doughnuts. They appear more clearly in these photos. Looking at these photos just makes me feel like modelling more things in 1/12th scale! If you feel that this post was too short - fret not as I will be posting a new blog entry later this week.